Conditions in inlets can change from favorable to difficult in a matter of hours. Inlets are killers — killers of boats and killers of people. Here, where the sea thrusts into the land, there often occurs a fatal attraction. When things are going to hell outside, we long to find that inlet and get in to safety. But that may be the worst thing we can do. Anything you know about one inlet may be irrelevant at the next. 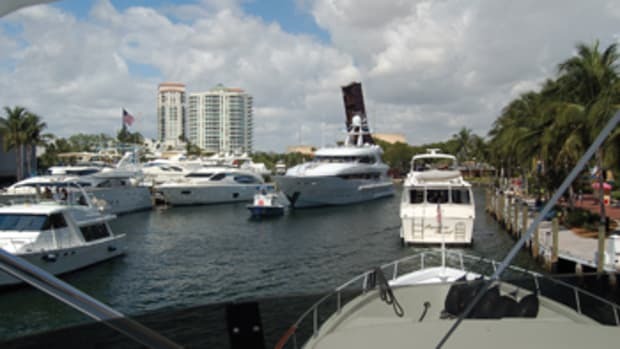 In this space, we’re going to examine some of the characteristics of inlets, some of the issues for boats using inlets and some of the tactics that can keep you safer. But no one truism covers all inlets and circumstances, except that knowledge of the territory and weather, experience and boat-handling skills can give you an edge. Little will be said about going out an inlet, because if the inlet conditions are bad and we’re inside, we should stay there and wait for better times. Some inlets are well-maintained, deep, broad and relatively benign. Many of these are “big ship” inlets. Large cargo carriers and cruise liners use them and, although sometimes dangerous for smaller boats, they are usually the safest and the most desirable to use. Some are shallow with twisting passages through rock or coral or sandbars that shift so much that buoys aren’t used and a boat aground can soon disappear beneath the sands. And then there are all those others. A creek or river emptying into a lake can be considered an inlet, but we’ll concentrate on ocean inlets. If you must regularly deal with an inlet on an inland body of water, remember that many ocean inlet issues are relevant to your area. A given inlet can be a piece of cake one day, or one hour of a day, and later become troublesome. We all know that waves are one of the things that can make an inlet dangerous. But many a skipper is lulled into a false sense of security when only a gentle swell is rolling in at sea. In the wrong circumstances, that gentle swell can become a much larger swell in the inlet. Several factors influence how the swell will behave. A major consideration is the current. When the tide is running into the inlet with the sea, it has a tendency to dampen the sea, sometimes almost flatten it, depending on all the conditions. But when the tide is running out against the waves, it can cause them to mount up and break. Waves don’t like resistance, and when they meet the resistance of the current in the inlet, or just outside the inlet, they can become monsters. Remember, they are also meeting the resistance of the rising bottom and this can make them dangerous even outside the inlet. Some inlets even have standing waves. These waves, sometimes tumbling over on themselves, seem to stay in place as the current meets the incoming sea. They can be treacherous. Any breaking sea is dangerous to a boat, but it is especially so in an inlet. Frequently, the break isn’t as easy to predict as it would be in the ocean, and whether you predict it or not, it can cause a boat to pitchpole or capsize. Standing waves can swamp a small boat. Even if the boat just veers off, these confused seas could cause it to be thrown into jetties, rocks or other obstructions toward the side of the channel. Winds also affect the inlet. Obviously, a local wind making waves will influence your ride. 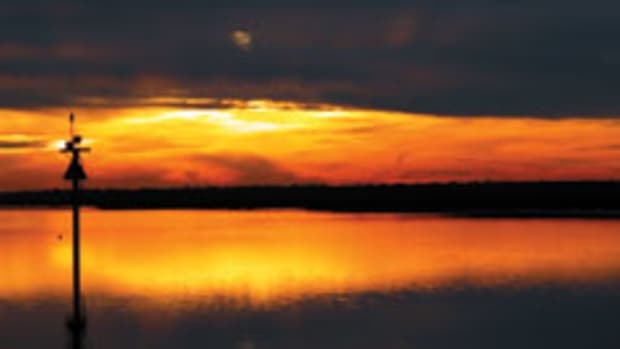 But sometimes the wind can be flat calm or even blowing offshore and the inlet can become treacherous, particularly in an outgoing tide, because of winds far away, not only in distance but perhaps even in time. Swell radiates out from a storm, traveling across the ocean. The waves from a storm even far offshore eventually could reach the coast. Many times we’ve left inlets on a beautiful, sunny, calm morning with a gentle ride to return late in the still-beautiful day (with perhaps a slightly more noticeable swell at sea) to find the inlet has become turbulent. A distant storm- generated swell had reached the coast. Some of the most extreme conditions like this we’ve encountered have been in the Bahamas. There they call it a rage. The inlets through the rocks, reefs and islands are relatively shallow, have strong currents and are often only a few hundred feet from a steep wall drop-off into great depths, where a storm swell, which has traveled freely for hundreds of miles or more, isn’t affected. When that swell feels the wall and then the shallow bottom, it is indeed enraged. We’ve known of people breaking their backs while trying to come into an inlet in rage conditions, and we’ve known of boats that were lost or capsized, including an island freighter with an experienced captain. There are many other areas where similar conditions can exist. Avoiding this means not only knowing the local weather, but also keeping up with offshore weather. You can do this with various weather services such as Chris Parker’s Marine Weather Center (for the East Coast, Bahamas and Caribbean, www.mwxc.com) and with NOAA offshore and high seas forecasts (found on SSB and online, www.weather.gov). 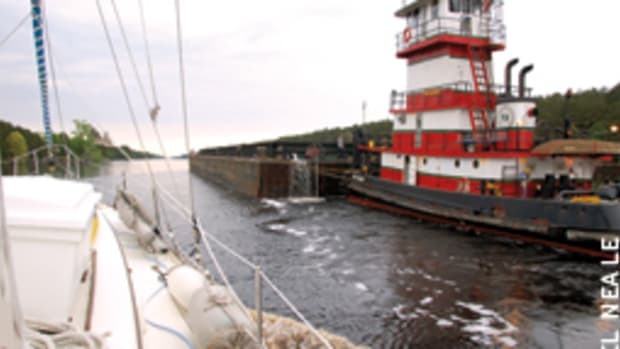 Harsh weather, especially thunderstorms, rain, fog and high wind, is bad anywhere on the water, but can be much more serious when running an inlet. 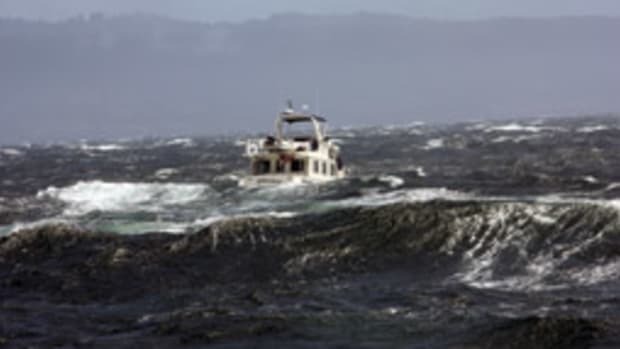 High wind makes boat control more difficult, and there is less room for error in an inlet. Anything that impairs visibility has obvious consequences on the water, but when you’re in restricted areas, such as an inlet, the consequences are much more serious, particularly when there are inlet obstructions or course changes to be made. Once, after being at sea for several nights, we were hit around 2 a.m. by a low-pressure area that the forecasters hadn’t anticipated. We were off North Carolina’s Cape Fear Inlet and desperate for some rest. It looked like the weather was clearing, so we headed in — unwisely, in retrospect. That inlet is deep and handles large shipping traffic, but there are also shoals and incredible current, and the channel isn’t straight. A whiteout thunderstorm caught us after we were committed. All instinct cried to get inside and out of the ocean in that weather, but back out in the Atlantic was where we truly needed to be. A shallow inlet, of course, can mean you might not have enough water under your keel. There’s also the serious issue of bottoming out in the trough of a wave, even though the reported water depth is ample. 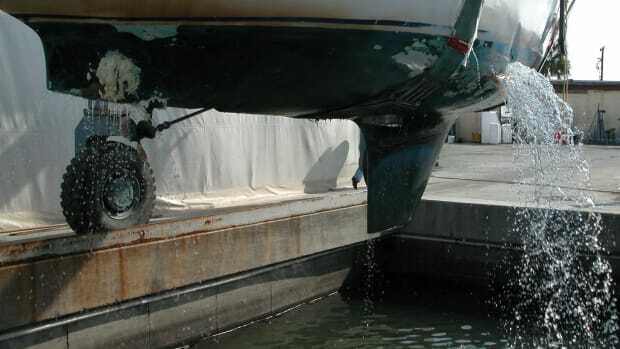 Slamming down onto hard sand or rock can break a boat’s back. Shallow inlets can also mean that waves coming in may have a much greater tendency to break in the inlet when they meet the resistance of the bottom. Although this might suggest that deeper inlets are less likely to develop breaking waves, that isn’t necessarily the case. A deeper inlet may have much more current than a shallow inlet simply because it can handle more water. Some inlets have enough current to stop or even push backward a displacement boat that doesn’t have a powerful enough engine. If a boat can’t overcome the current and gets trapped in an area of break, the beating can be relentless. 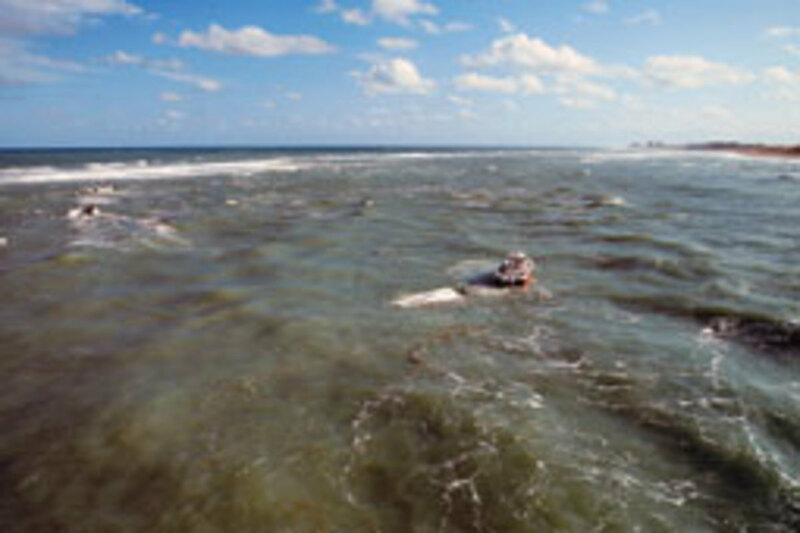 Some inlets — Fort Pierce Inlet in Florida, for example — have an outflow so powerful it affects incoming seas far beyond the sea buoy. Sometimes skippers, seeking to avoid the huge seas and strong current in the middle of an inlet, move off to the side where the water can seem smoother. However, often there’s a shoal or a submerged jetty off to the side. Width comes into play, too, in that a narrower inlet might have stronger current than one that’s much broader, where the water flow can spread out more. To make matters worse, a narrow inlet gives less room to maneuver in order to safely deal with the waves or perhaps other boats. And a deep, narrow inlet is more likely to have fast and strong current. A shallow, narrow inlet might have less current, but that current may be influenced more by obstructions. Obstructions such as rocks, ledges, coral heads and shoals (or boats that didn’t make it in and are on the bottom) are also game changers. Any of these can catch your boat, but even if they don’t, they can cause trouble. They also catch the moving water. This can result in eddies, tricky currents, upwellings and wave breaks that are difficult to predict and read without intimate experience with the inlet. We’ve even seen whirlpools in some inlets, which are caused by underwater obstructions or bottom contours. Some of these are strong enough to deflect the boat off course. If a sea is breaking or a rock is nearby, this can be trouble. Contours in the bottom or walls of an inlet can cause more than whirlpools. Contour anomalies may occur not only with rocky bottoms but also in sandy bottoms, and the anomalies can change as the bars shift. A storm, grounding or even change of swell slant can change sandbars in an inlet and, thus, contours and deflections in the current. Usually the current deflections in sandy bottom inlets aren’t as accentuated as those in a rocky inlet, but they can be just as insidious because the deflection, if you’re not taking bearings fore and aft, can set you aside into the bottom before you realize what’s happening. Bottom contours in rock are likely to cause far more obvious deflections, including upwellings, whirlpools, sudden thrusts of water to the side and simply unexpected current directions. While not considered to be technically an inlet, The Race at the eastern end of Long Island Sound and Plum Gut going into the “fishtail” of Long Island always strikes my mind as being, at the wrong times, horrific at maximum current flow because of bottom features and wind. Many shallow inlets, particularly along the East Coast, have shoaled significantly in the last few years. This is in part because of a lack of dredging. Some are so bad the Coast Guard has had to remove the aids to navigation. In Georgia and South Carolina, for example, it used to be relatively safe and easy to avoid some of the long, winding sections of the Atlantic Intracoastal Waterway by going outside for the day, coming back in for the evening or perhaps the next day or so. Now, many of these inlets are closed, except perhaps to those with very recent local knowledge. It’s important to keep up with the changes in conditions and aids at these and other inlets. Tools for this include Coast Guard Local Notices to Mariners (www.navcen.uscg.gov, click on “LNMs”) and our East Coast Alerts (www.boatus.com, search “east coast alerts”). But it’s important to understand these tools. We once watched a sailboat, wallowing down to the gunwales, being pulled into a yard. It had gone ashore in an inlet and was badly holed. “Sunk” would be a more appropriate word; it was floating only because of powerful pumps aboard. The skipper stood silently as the boat was hauled out, water pouring from the hull. He finally muttered that when he had looked at the chart, he had seen nothing but a large white area for the inlet, so he assumed this meant the inlet was a straight, deep fairway in from the sea buoy. Remember that electronic and paper charts often show the sea buoy offshore, but will not show any aids to navigation in unstable inlets, even though they are there. This is because they must be frequently moved to keep up with shoaling changes. There’s one more inlet feature I’d like to discuss: people. I’ll never forget coming into Government Cut in Miami one Easter afternoon after a quiet and peaceful winter in the Bahamas. It was like negotiating a maze of anti-aircraft ordnance. There were big boats, small boats and fast boats throwing huge wakes, and slow boats throwing beer cans, all seemingly with one thing in common: an idiot at the helm. And then there were the cruise liners trying to use the inlet, repeatedly but fruitlessly blowing five shorts to remind boaters they probably didn’t want to drown that day. It was one of the worst of the many bad inlet experiences we’ve had. Since then, we’ve always tried to avoid certain inlets on weekends and holidays. But fishing is for any day, and there are some very narrow inlets where it seems to be standard practice to fish in the middle of the channel, never mind that the larger boat coming in is going to have to climb the jetty to get around. While some inlets are relatively easy to enter at night, we try to avoid coming in after dark. Usually the “easier” night inlets are the ship inlets, which usually are deep and well-marked with lit ranges and other aids to navigation. However, these inlets are also usually in areas where there are many lights on shore. These lights may be flashing red (automobile tail lights), white and colored patterns (on cell phone and other towers), or lights in buildings, from local landing strips, from other boats in the inlet or in the harbor, from people engaged in all sorts of activities ashore, from people fishing on the jetty and from many other sources. In theory, you look at your chart, get the bearing and light characteristics of your relevant aids and follow them in. But it just doesn’t seem to work that way much of the time. Steering the boat, watching the chart, handling the waves and current, and quickly figuring out exactly what is and isn’t a relevant light can be difficult and disorienting in the dark. Of course, it should never be attempted without one or more capable lookouts in addition to the helmsman, but even with this, coming in when it’s dark can be very difficult. Perhaps the more night-friendly inlets are the well-marked shallower inlets in less-populated coastal areas. But in those you might not see that wave mounting up behind you, getting ready to break. Obviously, one of the first tactics is to learn the conditions and the inlets as we’ve discussed above. From that knowledge, you might conclude that it isn’t wise or safe to go into a given inlet at the time. We’ve seen far too many boats (and people) lost simply because a normally good inlet was used under the wrong conditions. Paradoxically, we’re often most eager to get into an inlet when we least should. This is usually because of storms, rough water or encroaching night. It’s a difficult decision to remain out at night in stormy seas with a seasick and exhausted crew in order to make the next inlet or wait for better weather at your chosen inlet. Far too many choose to take the chance and head in, and far too many don’t make it. The best tactic is to plan ahead carefully. Have a good prediction as to what the weather will be, not just when you leave but when you arrive. Check ahead for current condition at the time of your anticipated arrival. And maintain your speed so you make the inlet on time. 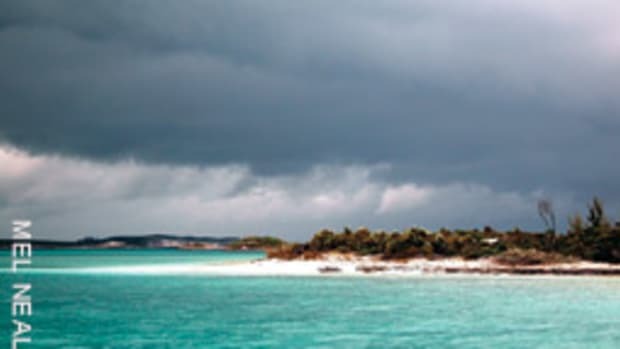 One year in the Bahamas, a boat had to be rescued three times in less than a week when negotiating inlets in the Exumas because the skipper chose to sail instead of motor, putting him at the next inlet down the island chain after the front arrived or after dark. If he’d motored on those occasions there probably would have been no problem. If practical, shoot for a slack or incoming tide, but remember that while an incoming tide can flatten out an incoming sea, it also can diminish steering capability for slower boats, making tricky maneuvering more difficult. Use your radar and a good pair of binoculars to pick out aids to navigation and landmarks, not just while running the inlet but also before you enter. While this won’t help in whiteout conditions such as those we encountered at Cape Fear, these tools will help you get a feel for where you’ll need to go while you have time to sort things out, rather than when you’re in the heat of it. Aids often are very hard to find against the shore, can be difficult to pick out because of distance or structures on shore, and they’ve often been moved so they’re not where you expect them to be from studying the chart. Even if aids are in their charted location, turns in the channel, coupled with the confusion of breaking shoals to the side, can make it hard to pick them out. This is when you’ll really appreciate that you invested in good binoculars rather than el cheapos. We use the Steiner 7x50 Commander XP binoculars with a compass bearing finder. They have no-hassle focusing, float with a strap, the lenses are coated so you can quickly wash off salt spray, and the optics and light-gathering features are superb. Other companies also offer excellent binoculars. When you’re looking into a questionable inlet, you’ll realize that this is one of those many pieces of equipment where it isn’t wise to scrimp. While running the inlet, have your mate stand by keeping track with the chart plotter or chart, watching the radar, finding the next sets of aids with the binoculars and watching astern for surprise waves. This can be very difficult for the helmsman to do while handling the boat. Skillful maneuvering is often your ultimate weapon when running an inlet. First, study all of the issues discussed above, then carefully study and memorize the charts of the inlet (unless you’re very familiar with it). You might not have time to figure out the charts once committed. Make a plan. You may have to abandon it, but it helps to have in mind various things to do depending upon what happens. A good example of the need for advanced chart study and planning is seen in those inlets where, because of hard or soft bottom deflections, the current pushes the boat to the side. 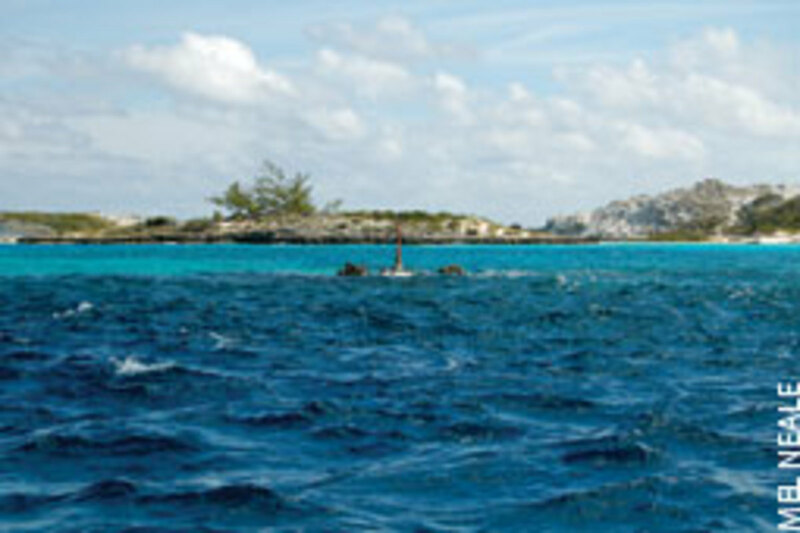 Big Rock Cut at Staniel Cay in the Bahamas is one such place. You must run into the inlet and then, if heading to the village, turn to port. But an incoming tide will be pushing you into a brown bar (rocky) to starboard after you turn. You’ll be moving too quickly and with too much reef around to familiarize yourself with this feature while in the middle of it. And following the icon on a chart plotter probably won’t save you because the rocks are too close, the charts aren’t that accurate, and the push to the side is too swift. You must take visual bearings on landmarks fore and aft. You’ll see that you’re being pushed to the side, and you can compensate. If you don’t, you may find yourself on the rocks, as many have. Sometimes you must use every ounce of skill, seamanship and muscle you have to stay out of trouble. Usually the worst situations are when you’re coming in from outside, running with large and/or breaking seas. 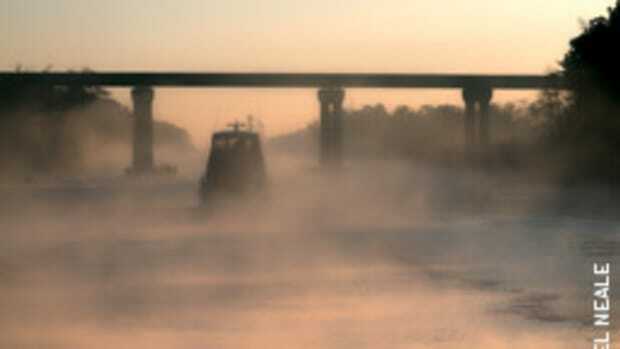 How you handle them depends much on running characteristics of your boat. There are too many variables to discuss here, but suffice it to say that a slow-moving displacement hull will have far different issues than a planing hull — for example, a fast, well-built sportfishing boat with powerful beasts in the engine room. I’ve run many inlets in these conditions in both types of boat and, in my opinion, the well-built planing hull, if large enough for the seas, is easier to handle because there are more control options. If you feel that kiss of cold, wet breath on the back of your neck while running a planing hull and look back to see a breaker towering over you, there is more chance of outrunning it or at least getting just beyond the break than in a slow-moving displacement boat. Or if you see a wave mounting up ahead, you probably have more choices in how you’re going to handle it in that planing hull. You might decide to run up onto its back a little, but remain behind the crest, on the step with your bow up, until it crumbles ahead of you and then power through the turbulence. If you know the drop of the break ahead and are confident the length and power of your boat can handle it, you may decide to go through, jockeying the throttles to keep the bow up. You might make a decision like this if you look behind and see following seas beginning to break. In a displacement boat, you’re more in the situation of having to handle what you get, working the throttles and using the wheel to keep you out of trouble. Whatever you do, it usually involves decisions on the spot, based on what you see, feel and understand, and also based on knowledge of your boat and your experience and skill set. There are no ironclad rules you can learn from a book. We have a true motorsailer, and I think these are far better in inlets than displacement boats without a sail (such as trawlers) or with sails but weak engines. 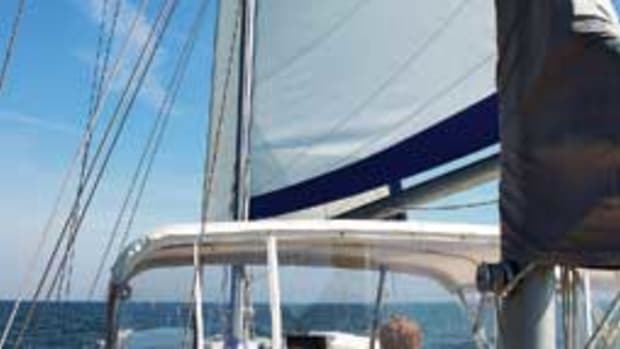 Having the sail up in following seas can not only help to stabilize you but, unlike the mechanical stabilizers on a trawler, can provide extra power and speed, giving you more control with wise engine use. However, a drawback is that if you allow the bow to bury and find the stern pushed around so that the sail is flat to the wind, you can have a serious problem. Of course, this is less likely to happen with a good, strong engine and savvy steering. Other experienced skippers might disagree, but one of my tactics for handling large incoming seas when coming into an inlet is to try to avoid powering over the top of waves because it’s very difficult to predict how steep and deep the drop will be on the other side. If that drop is too steep and deep, your bow may bury in the trough and the wave can grab your stern, throw you around and cause you to capsize or pitchpole. When caught in large seas — and I try to avoid this — I attempt to keep the boat on the back of the wave and not too close to the crest, moving with the wave as long as I can until it hopefully crumbles ahead of me. This is essentially surfing the boat, and it can be a very heady experience, but it also carries a fair bit of risk and can be hard on the boat’s steering and other gear. It requires that you really be on top of the situation, reading and feeling the sea and boat movement carefully and responding exactly as needed. It also requires that you keep an eye astern to be sure a following mountain of water isn’t about to crash onto the boat. This tactic may be great for some boats and circumstances, but totally inappropriate and dangerous for others. This is true for much of what I’ve said here because that’s the nature of inlets, boats, sea conditions and skill sets. I’ve described many white-knuckle inlet scenes here, but the whole story would include many more good and easy inlet experiences. Inlets are usually a highlight for Chez Nous because they mark the end of a passage and the beginning of an enjoyable stay in a beautiful harbor. At other times, they mark the beginning of a passage at sea, when I’m finally free. As I feel the swell of the ocean with the sea buoy astern, I turn around and offer a middle-digit salute to the landlocked confinement I’ve escaped.